From using a custom designed app on a tablet to decode a clue or using your own smartphone to snap a selfie on a treasure hunt, we’re constantly imagining new ways to integrate mobile technology in fun and innovative ways. Everyone knows that a great team building event can be murder to pull off. But, what makes this team building event great is murder – a murder mystery activity that is! 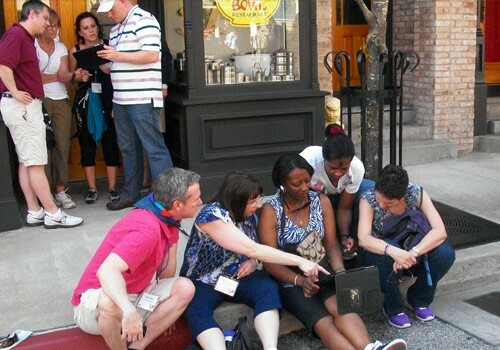 Here’s the plot – guests are transformed into detectives and complete crime scene-related tasks released to their device. Each time one is completed, a piece of information is released that will help them identify the guilty suspect, similar to the board game Clue. If you’re interested in participating in an Escape Room, but you have too many people to fit in one room and/or don’t have the time in your schedule to go off-site to one, we’ve cracked the conundrum on how your group can still see if they have what it takes to escape! 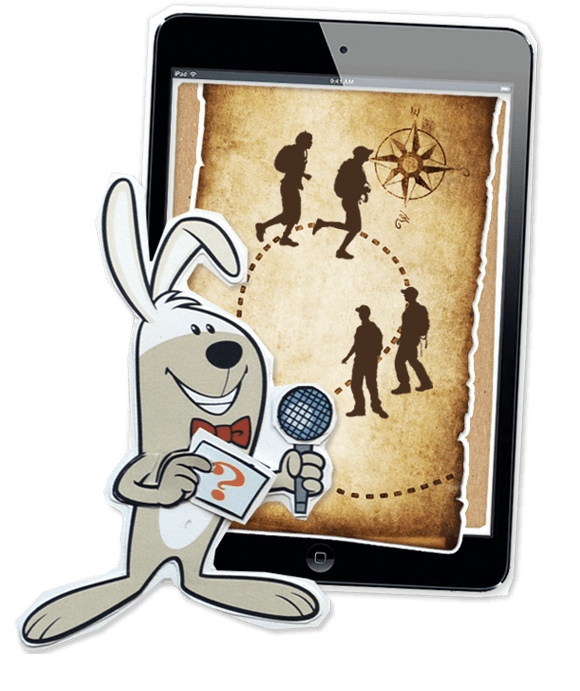 Have your guests participate in a virtual Escape Room where they must crack three different codes to escape a series of screens on a team iPad before the time on the countdown clock runs out. 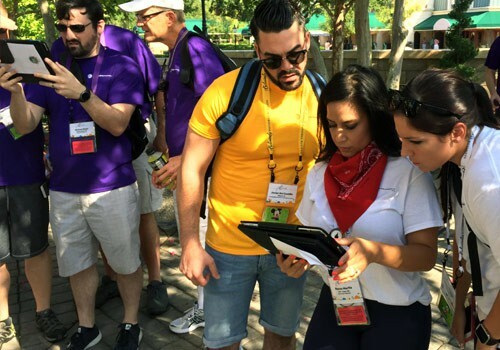 This high-tech scavenger hunt is the perfect way for teams to explore their surroundings using an iPad with a custom app to navigate to various GPS “hotspots” to unlock tasks. Challenges, which can put the spotlight on the event area, can wrap in photos, videos, trivia, music, and more! Teams can watch their progress on a live leaderboard until shortly before the event ends when teams meet back up where the winning team will be revealed. Old-fashioned fun meets new technology in the iPlay event, which finds teams competing in activities inspired by game show greats on an iPad at their table. An interactive emcee keeps the energy level high as they introduce games such as Survey Says, Match Game, What’s That Tune? In Jeopardy, Is The Price Right? and more, all of which can be designed around your theme or company information. It is usually considered impolite to make a scene. But, during this team building activity, it’s actually encouraged as teams create their own must-see video for their company using a custom app on an iPad that strings their clips together into one slick show. The activity ends with Oscar-like trophies being awarded to those videos the audience enjoyed best. Teams climb to new heights, racing to be the first to complete outdoor and mountain-themed tasks and earn the most points by doing them correctly. Teams do get a map for their climb, only it’s not on paper – it’s on an iPad. Pictured on the screen is the mountain they must climb and the routes they must conquer to ascend. When they complete the challenge connected with each route, they earn points based on how many attempts it took them to traverse each one. Can’t “rock” a challenge? No problem! Mountains have passes and so too do teams, but they’ll lose points for doing so! Looking for a way to connect your attendees remotely before your meeting? 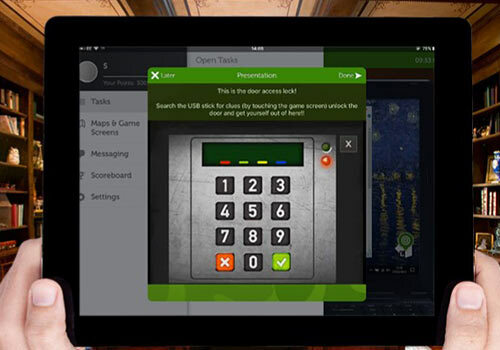 Smart Connections allows your attendees to connect using their own phones or tablets while gamifying educational learning objectives. Colleagues can play individually or earn points for their region while completing a variety of challenges. The connection and interaction continues on-site when attendees meet face to face. The premise behind Random Acts of Kindness is that it just takes one – one action, one smile, one favor, one comment, etc. – to make a difference. And, in this event, teams will experience that power not just once, but many times as they complete challenges on a team phone or tablet that build on this premise! Plan Your High-Tech Adventure Today! We were asked to develop a fun and interactive way to test the comprehension and retention of training information that a client’s employees had received. Technology played a leading role in this event with a custom designed game powered by multiple iPads®. We split all of the participants into two primary groups and both groups were given iPads. The first group had to solve trivia questions Jeopardy-style using the devices in addition to performing physical challenges. Meanwhile, the second group was busy with an Amazing Race-themed game where they had to track down activity locations using their tablets and perform a task. Both groups had to play both games to finish the event. Ready to Plan A High Tech Adventure for Your Team? Contact Us Today.